Holiday marketing is a HUGE opportunity not just for retail and eCommerce – all businesses can take advantage of the season to boost their conversions. Take managed cloud hosting company Cloudways for example. They used holiday-themed campaigns year-round to get a 120% increase in free trial signups. But investing in seasonal designs can take time and resources that many small businesses don’t have. That’s why we’ve released a new “Spooktacular” holiday campaign theme for you. 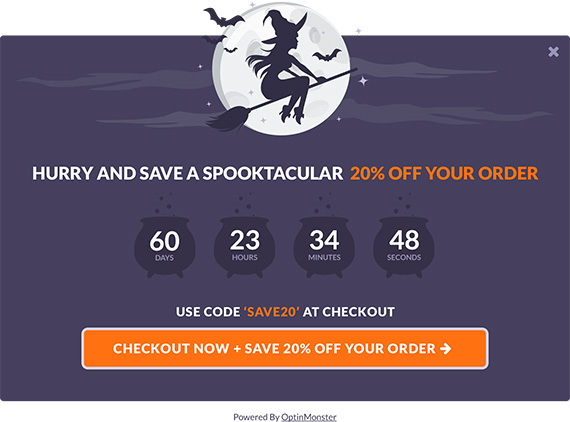 Now anyone can create high-converting Halloween campaigns with just a few clicks. You can use it with a countdown timer to create a sense of urgency, or create high-converting Yes / No campaigns with a Halloween theme. It’s easy to switch the template for any existing campaign, and you can schedule a campaign to run just for the holiday season. That’s all for this week, but we have a few more holiday themes and other features in the works. Be sure to subscribe to the newsletter and follow us on Twitter and Facebook for updates. As always, we appreciate your support and thank you for your feedback! Ready to boost your subscribers and revenue this holiday season? Now is the perfect time – click here to get started with OptinMonster today!